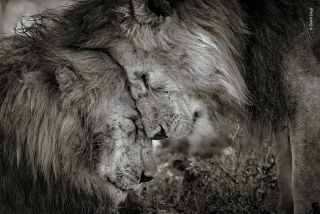 A heart-warming image that shows a moment between a pair of male lions is the winner of the Wildlife Photographer of the Year LUMIX People's Choice Award. 16,000 nature fans may have voted, but London-based photographer David Lloyd emerged as the favourite. His image was chosen from a shortlist of 25, selected by the Natural History Museum from over 45,000 photographs submitted for the 2018 competition. The overall winner of the the latest Wildlife Photographer of the Year was Marsel van Oosten. Who are the subjects in David's winning shot? "I’m so pleased that this image did well because it illustrates the emotion and feeling of animals and emphasises that this is not limited to humans," he says. "It is something I think more people need to be aware of for the sake of all animals." The LUMIX People's Choice award is sponsored by Panasonic. "It is a great honour to be involved in the LUMIX People’s Choice awards and to be able to champion the image that resonates most with the public," says Mike Owen, the Professional Imaging Marketing Manager from Panasonic UK. Four Highly Commended images also won over the hearts of the public. These include Matthew Maran’s timely shot of a fox walking towards graffiti art in London, and Justin Hofman’s heart-breaking image of a famished polar bear in the Canadian Arctic. Wildlife Photographer of the Year is the Natural History Museum’s annual showcase of the world's best nature photography and photojournalism. Seen by millions of people all over the world, the images celebrate the astonishing diversity of life on earth, whilst challenging us to address the big questions facing our planet. The People's Choice photographs will be showcased in the Wildlife Photographer of the Year exhibition at the Natural History Museum until it closes on 30 June.